Quality of life in any city is measured by a blend of ingredients that impact on the day to day, such as green spaces, air quality, waste management, education choices or residents’ ability to move around by car, bike or public transport. All EU citizens, plus non-EU citizens who’ve been resident for at least five years, can sign up to vote for local communal elections at www.commissioner.brussels. But the majority of the decisions about the above topics are made at the regional Brussels-Capital parliament level. More than 300,000 non-Belgians – over one third of the city’s 1.2 million population – living within its jurisdiction are currently excluded from voting for the people taking those decisions. That’s why a citizens-led campaign has been launched to lobby for a change in the law to give non-Belgians the right to vote at regional level, and rectify what they’re calling the “biggest democratic deficit in the EU”. 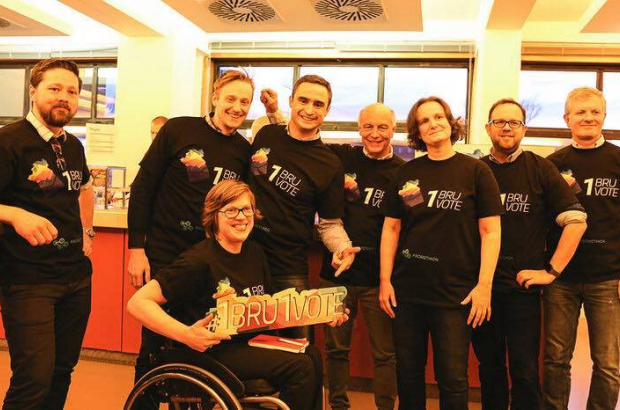 The non-partisan 1Bru1Vote movement says the city’s 220,000 EU and 90,000 non-EU residents should no longer be treated as “second-class citizens”, and an online petition has so far attracted more than 3,500 signatures. Currently most non-Belgians living in Brussels, which is a ‘city region’, only have the right to vote in their local commune. To do so, they must register ahead of the elections. With the next municipal vote due on 14 October this year, they need to sign up by 31 July. Despite awareness-raising campaigns, registration levels remain low among non-Belgians; 13.6% of the eligible electorate took part in 2012. This low participation rate is raised by some when debating whether to extend non-Belgians’ voting rights to regional elections, says one of 1Bru1Vote’s organisers, Nora Bednarski, who is Canadian-Polish and has lived in Brussels since 2002. But she says it’s due, in large part, to a lack of information on communal elections, and the fact that expats often don’t realise they have to register to vote months in advance. Given the chance, residents of the Brussels-Capital region do want to influence their environment, she says. Being civically active is a “theme that has run throughout my life”, says Bednarski, a former paralympic swimmer. From her early activism on urban planning and disability issues, to setting up a neighbourhood committee on arrival in Forest, to campaigning to safeguard listed buildings and protesting against “radical” tree pruning on a Brussels avenue, she’s always been involved. “I really strongly believe that the individual citizen can make a difference, from small issues like improving the pavement in one’s neighbourhood to trying to change legislation. There are a lot of non-Belgians who get actively involved in their neighbourhoods, so this argument that there’s disinterest, that they don’t really care, is patently wrong,” she says. “Over 300,000 people are unable to vote – that’s more than the population of some cities. Representing 35% of the population, that is a very big problem when it comes to the legitimacy of how Brussels is governed,” she adds. Italian Gaia Calligaris, 31, is a voluntary co-ordinator with the Citizen Refugee Support Platform and has lived in Brussels for six years. She says she has registered for the communal elections and would use any future right to vote at regional level. “I want to be able to vote in the same way I do for my commune,” she says. Although passing a new law in time for the next regional elections in May 2019 looks unlikely, 1Bru1Vote is using the run-up to the 2018 communal elections to campaign for the extension of voting rights as soon as possible. They are lobbying candidates and asking communes to draw up supportive motions to take to the regional and federal parliaments. So far, five communes are understood to be drafting motions and meetings with others are planned, say campaigners. Also supporting 1Bru1Vote is Thomas Huddleston, coordinator of the EU-funded Vote Brussels local voter registration campaign by Migration Policy Group as part of the FAIREU project. He told The Bulletin that almost all political parties were supportive and now needed to agree how it would work. He’s happy to see not only non-Belgians being activated by the campaign, but many Belgians lending their support. “Belgian citizens understand how diverse the city is and see this democratic deficit as part of the governance problem that needs reform. So we’ve been finding a lot of allies,” says Huddleston, who is originally from the US. But there are challenges, says Bednarski, who concedes that the complex layers of Belgian political structures can be confusing and frustrating for non-Belgians. Aysen Sevinc, 31, from Turkey, has lived with her husband in Brussels for 18 months and plans to stay until he retires in 20 years. She was “disappointed”, she says, to find that, as a non-EU citizen, she wasn’t eligible to register for elections in her commune of Woluwe-Saint-Lambert until she has been resident for five years.